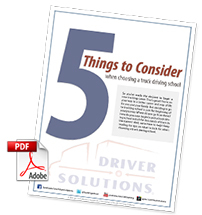 Driver Solutions will soon be releasing a FREE guide to help you find the best truck driver training school that meets your needs. If you're new to truck driving and considering CDL training, this is the guide you need to get started. You'll be able to use the information from this guide to quickly narrow down the thousands of choices out there to the ones that will help you get a new career started on the right track. A career in the trucking industry can be incredibly rewarding and it all starts with choosing the right truck driver training school for you. Sign up for free updates from Driver Solutions below and we will notify you FIRST when this guide is ready!